For first-time tarot card users, purchasing your first tarot deck can be quite a confusing and weird one. And while some have this idea that a tarot deck should be given to you, instead of buying it, Tarot experts believe there is nothing wrong with buying the deck yourself. Just think of buying one as a gift to yourself, because you will be purchasing a tool that can help you open up your life. 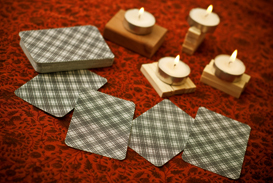 If you want to become a professional tarot card reader, below are a number of easy-to-follow steps to consider. What Are The Primary Tarot Decks Used Today? According to divination experts, there are two tarot card decks that are considered the ”primary” decks used today. These are the Rider-Waite deck and the Thoth Tarot. Each deck comes with its own mysterious backgrounds, although the Rider-Waite deck is popularly used for conventional tarot seminars and classes. The Rider-Waite deck is also popularly used as the main reference material in Internet Tarot sites, and in psychic forums and message boards. The Rider-Waite is also highly recommended for first-time users. Before buying your first-ever tarot card deck, think about what role or purpose will it play in your personal journey to awareness and self-discovery. The tarot deck can actually be used for healthy self-exploration, as well as for personal growth. The tarot deck can also be used for meditation and self-acknowledgement. It can also be utilized for helping the individual see the choices available to him or her. It can also be a tool for helping the person analyze the past and present, clarify goals or objectives, predict the future and access the hidden depths of the subconscious. In effectively learning the mysterious and ancient art of tarot card reading, the individual first needs to do a couple of things. He or she can read books, and then take a formal course, and even get a certification from reputable tarot organizations and groups. There are also lots of tarot reading classes on the Internet, and offline conducted by registered Tarot organizations and independent tarot teachers. Most divination experts strongly suggest that tarot readers get certified. You can get this by visiting the Tarot Certification Board of America’s website or office, so you will learn the seven levels of certification, and what’s required for officially obtaining them. The aspiring certified tarot card reader will also need to pass a number of standardized tests as well. To sharpen your budding tarot card reading skills, you can perform free reading sessions at parties and other family or school gatherings. You can also opt to rent a booth at any psychic fair or convention, and conduct readings, as well as promote your skills there. You could even make deals with a restaurant or bookstore, where you can rent a table, and pay the bookstore or restaurant owner a small percentage of your earnings.